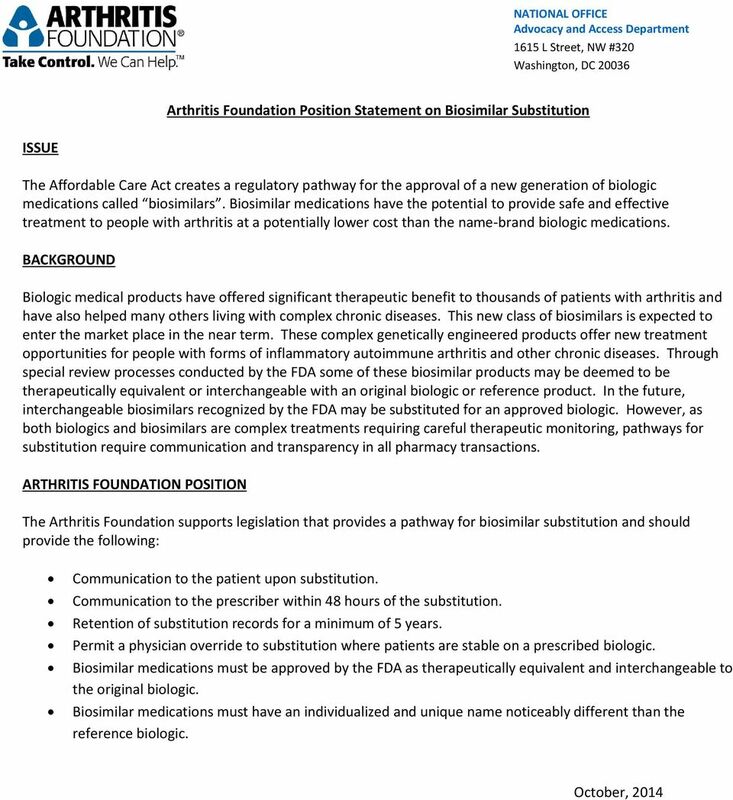 Download "Arthritis Foundation Position Statement on Biosimilar Substitution"
3 Arthritis Foundation Position Statement on Narrow Provider Networks/Network Adequacy Many people with arthritis who are enrolling in health insurance plans are learning that the availability of doctors, specialists and hospitals through those plans is extremely limited. 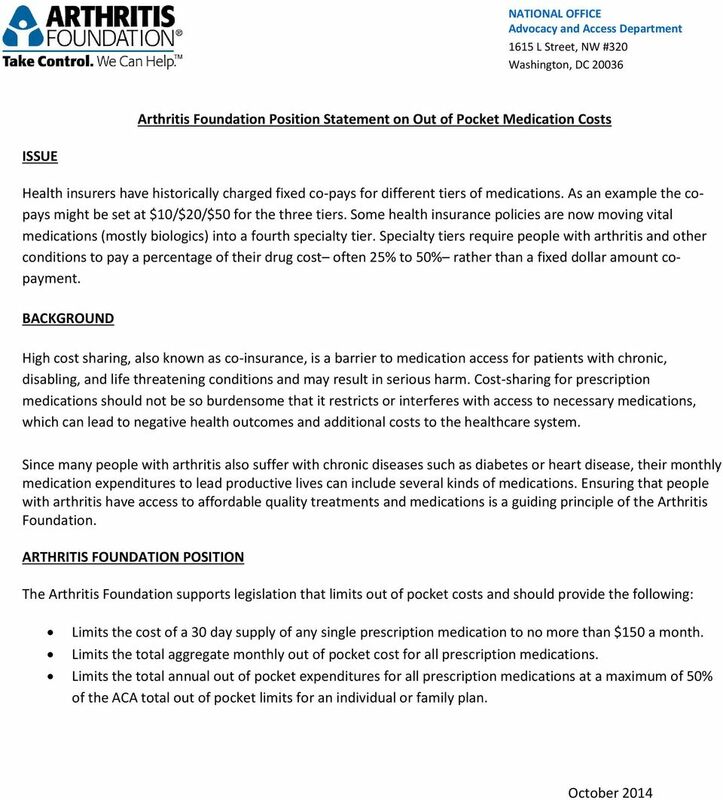 Patients who do not have access to necessary medical care through their insurance plans are forced to use out-of-network providers for care. Because insurers do not pay for out-of-network care, patients only have access to care that is specific to their needs by absorbing a substantial cost sharing obligation or by switching doctors. Many health insurance plans limit the number of doctors, hospitals, facilities and services that are available to their plan enrollees. 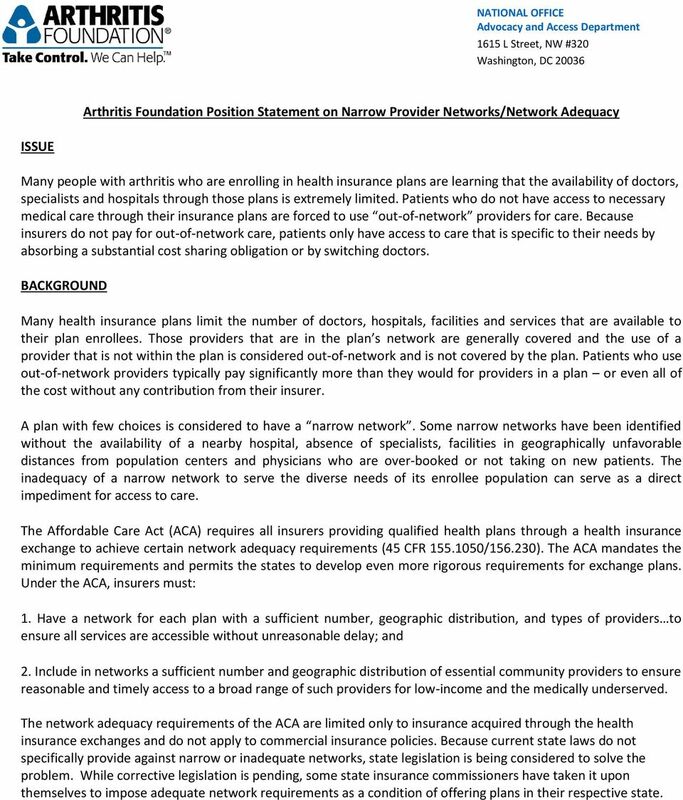 Those providers that are in the plan s network are generally covered and the use of a provider that is not within the plan is considered out-of-network and is not covered by the plan. Patients who use out-of-network providers typically pay significantly more than they would for providers in a plan or even all of the cost without any contribution from their insurer. A plan with few choices is considered to have a narrow network. Some narrow networks have been identified without the availability of a nearby hospital, absence of specialists, facilities in geographically unfavorable distances from population centers and physicians who are over-booked or not taking on new patients. The inadequacy of a narrow network to serve the diverse needs of its enrollee population can serve as a direct impediment for access to care. The Affordable Care Act (ACA) requires all insurers providing qualified health plans through a health insurance exchange to achieve certain network adequacy requirements (45 CFR / ). 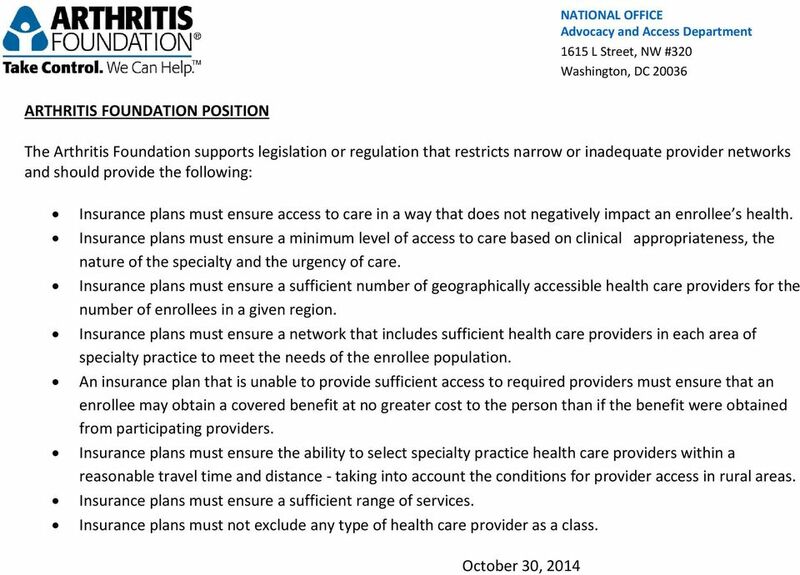 The ACA mandates the minimum requirements and permits the states to develop even more rigorous requirements for exchange plans. Under the ACA, insurers must: 1. Have a network for each plan with a sufficient number, geographic distribution, and types of providers to ensure all services are accessible without unreasonable delay; and 2. Include in networks a sufficient number and geographic distribution of essential community providers to ensure reasonable and timely access to a broad range of such providers for low-income and the medically underserved. 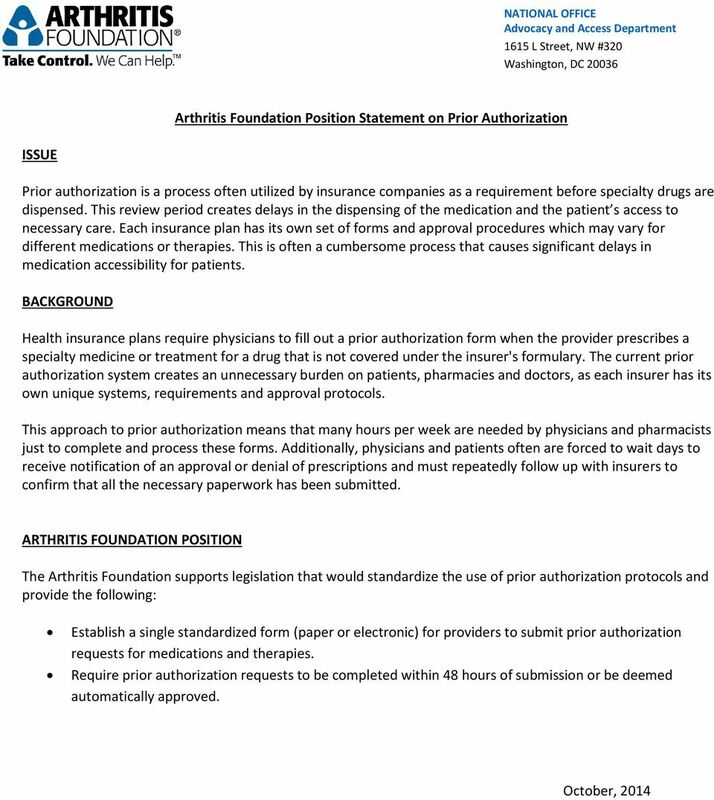 The network adequacy requirements of the ACA are limited only to insurance acquired through the health insurance exchanges and do not apply to commercial insurance policies. Because current state laws do not specifically provide against narrow or inadequate networks, state legislation is being considered to solve the problem. While corrective legislation is pending, some state insurance commissioners have taken it upon themselves to impose adequate network requirements as a condition of offering plans in their respective state. Financial Planning. Patient Education Guide to Your Kidney/Pancreas Transplant Page 18-1. For a kidney/pancreas transplant. Patient Education Page 18-1 For a kidney/pancreas transplant Kidney and pancreas transplants are expensive. Planning your finances, both your income and insurance, will be a key part of planning for transplant. I Have Health Insurance! Now What? UNIVERSITY OF VIRGINIA HEALTH PLAN 2015 SCHEDULE OF BENEFITS CHOICE HEALTH SERVICES PROVIDED Direct Access through UVa Provider Network 1. PLAN COINSURANCE Applies to all expenses unless otherwise stated. Informational Series. Community TM. 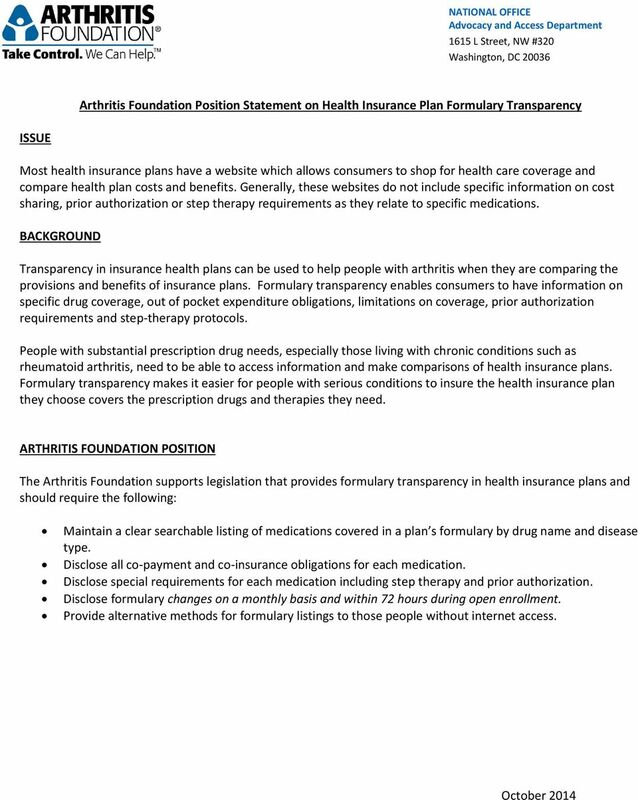 Glossary of Health Insurance & Medical Terminology. (855) 624-6463 HealthOptions. 2016 Benefits Enrollment SUPPLEMENT Human Resources Finance & Administration FOR PRE-MEDICARE RETIREES November 2015 This newsletter supplement concerns current pre-medicare-eligible retirees and spouses. How Much Does that Medication Cost? 8 August 2011 How Much Does that Medication Cost? 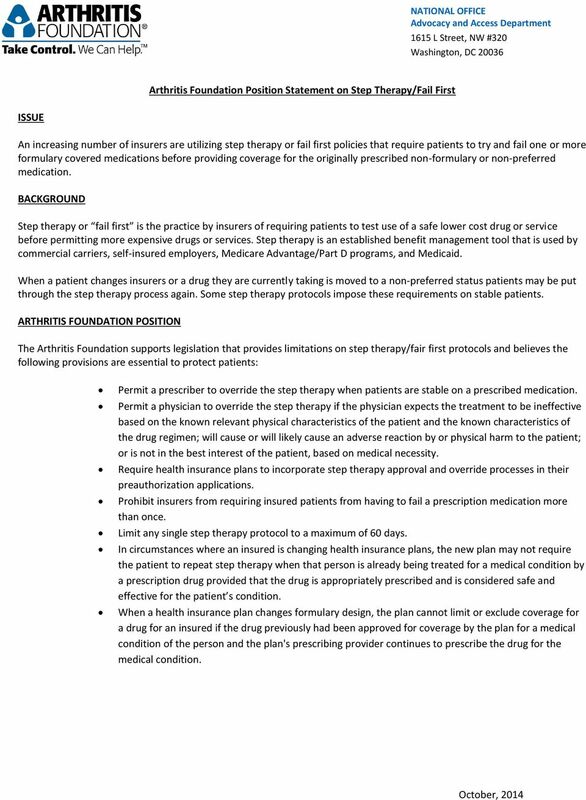 A Study of Medicare Beneficiaries Knowledge of Out-of-Pocket Costs for Prescription Drugs on the Specialty Tier By Dr. Eugene P. Ericksen and Melissa A.